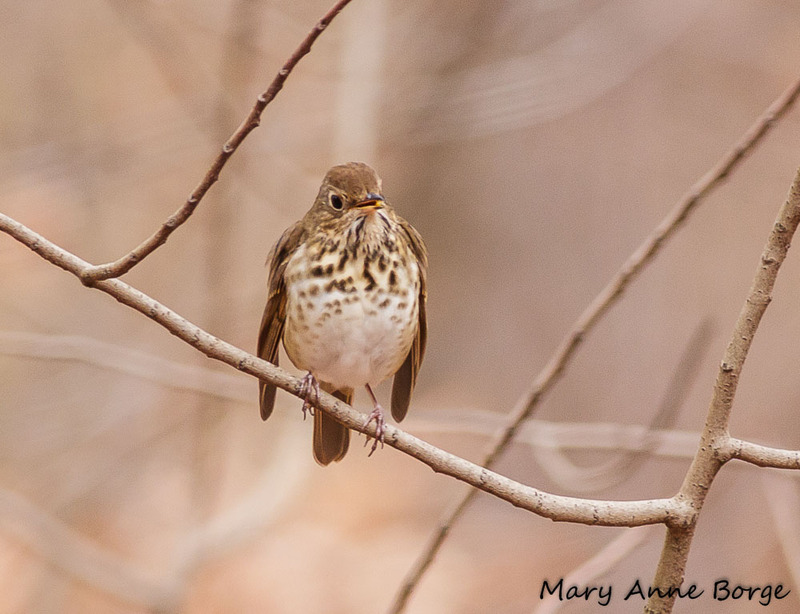 Praying for spring? 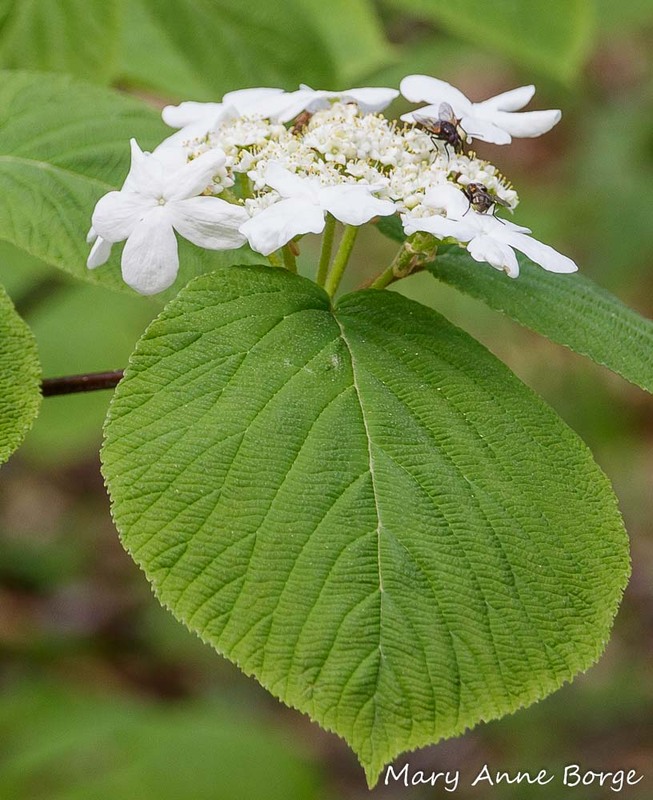 Based on appearances, it looks like Hobblebush Viburnum (Viburnum lantanoides, synonym V. alnifolia) is doing the same thing. 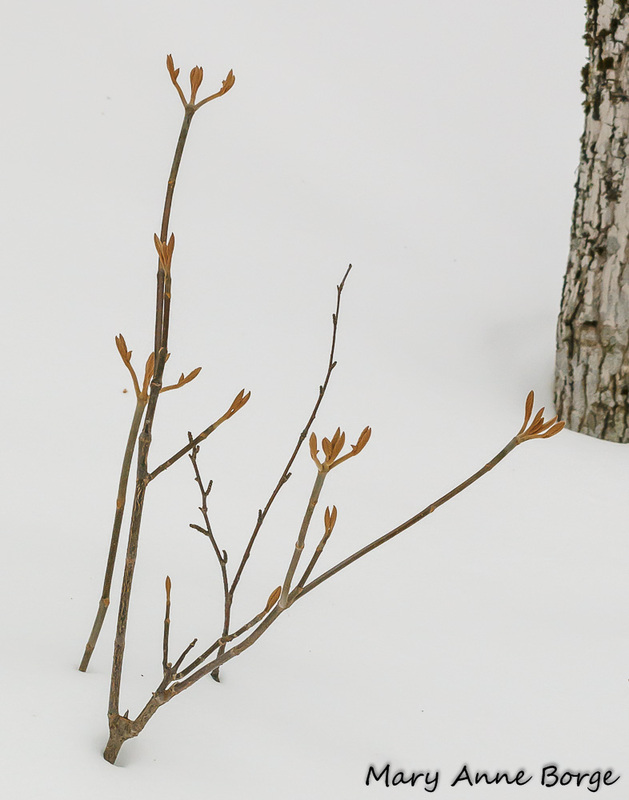 Many woody plants can be identified in winter by their distinctive leaf and flower buds, including Hobblebush. 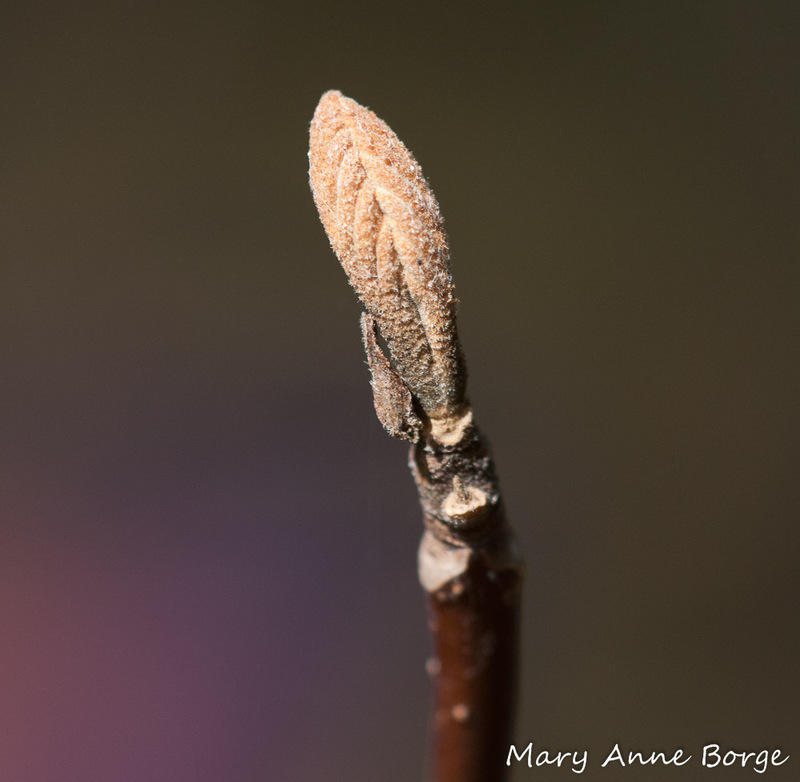 Its leaf ‘buds’ are miniature immature leaves that survive the winter without protective scales. 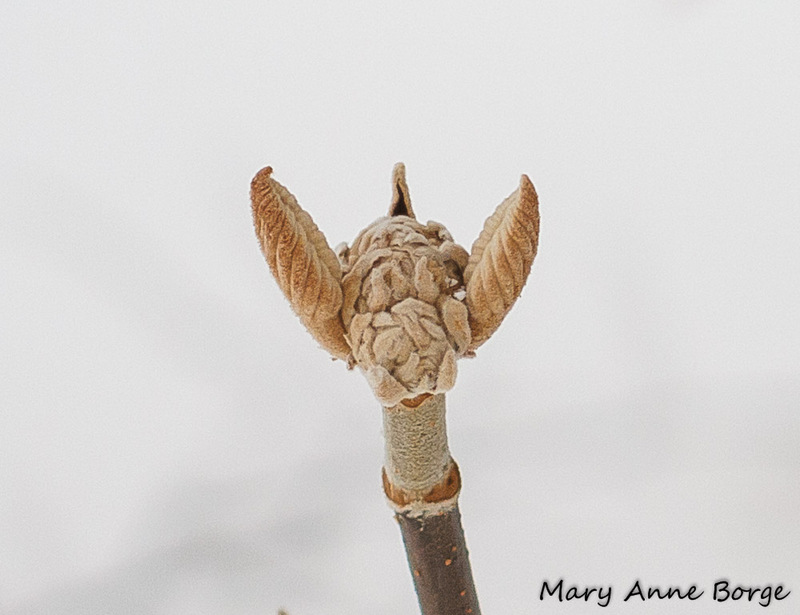 Since Viburnums have leaves opposite each other along their branches and at branch tips, these leaf ‘buds’ are paired together, a perfect mimic of hands held in prayer. 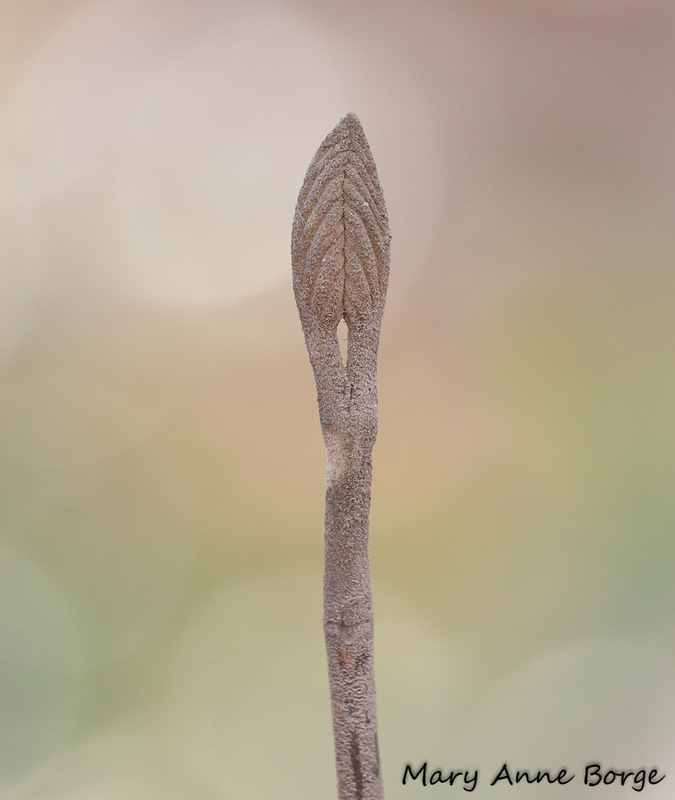 Hobblebush Viburnum (Viburnum lantanoides) ‘naked’ leaf buds, a term that refers to buds without protective scales. Where flower buds are present, they nestle between the two leaves in a pair. 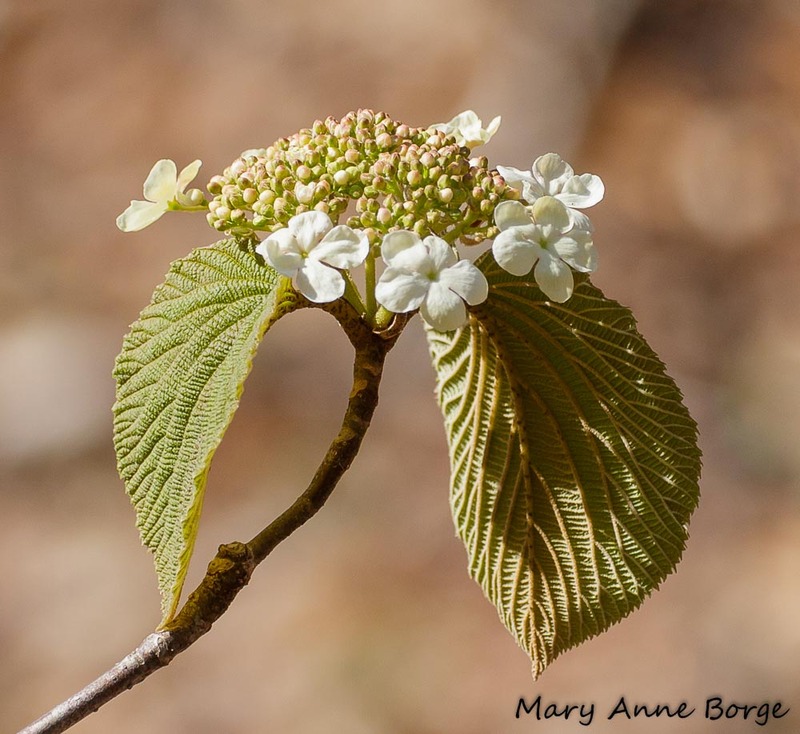 In this configuration, the flower buds resemble a moose head, with the leaf ‘buds’ playing the role of moose ears. 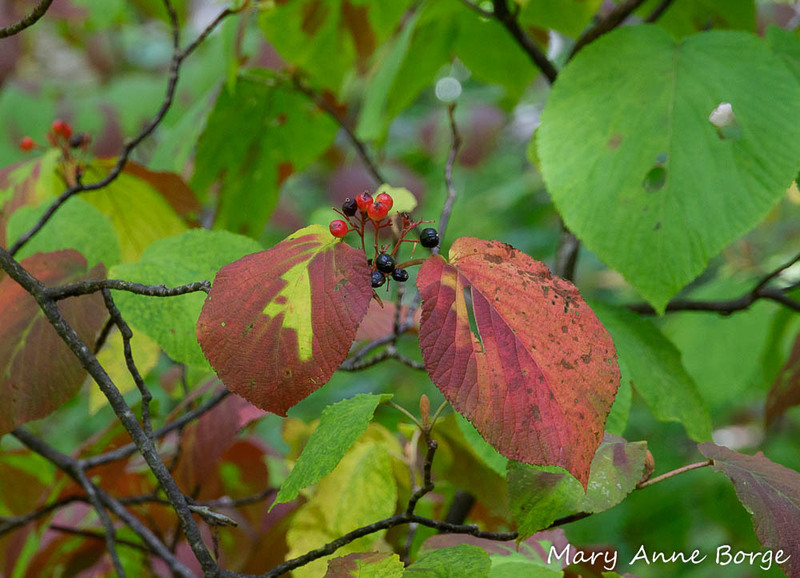 That could explain why another common name for this shrub is Moosewood! Hobblebush Viburnum (Viburnum lantanoides) leaf and flower buds. Do you see the resemblance to a female moose head? 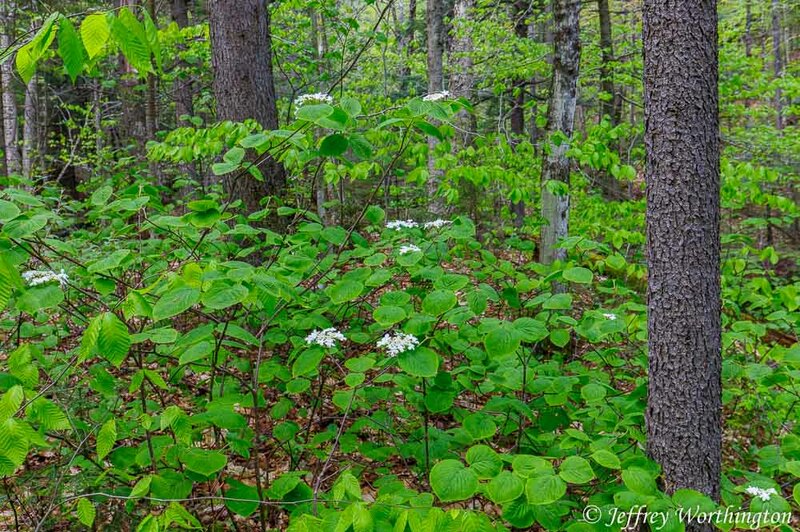 Before the canopy trees have finished leafing out in spring, Hobblebush leaves begin to expand and grow, maximizing their ability to photosynthesize. At the same time, the flowers also begin to bloom. Like some hydrangeas, Hobblebush inflorescences have two types of flowers, large sterile flowers around the perimeter of the flower cluster that are incapable of producing fruit, and masses of small fertile flowers in the center. The sterile flowers open first. 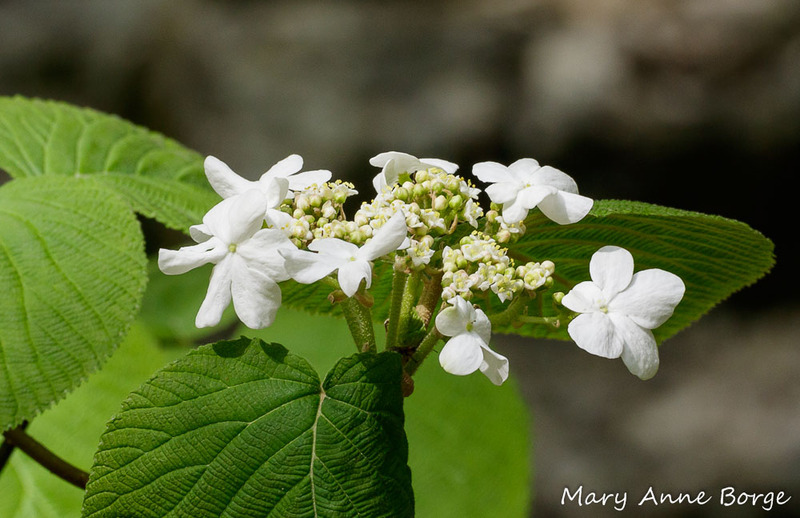 Hobblebush Viburnum (Viburnum lantanoides), with leaves unfurling and sterile flowers blooming. The fertile flowers in the center of the inflorescence are still in bud. The fertile flowers are where the serious work of pollination takes place. They open a few at a time over several days, giving the plant a long period during which to lure visitors to help pollinate its flowers. At the same time it’s providing food to those pollinators over many days. It’s a win-win. Hobblebush Viburnum (Viburnum lantanoides), with fertile flowers beginning to bloom. Why would a plant have sterile flowers? 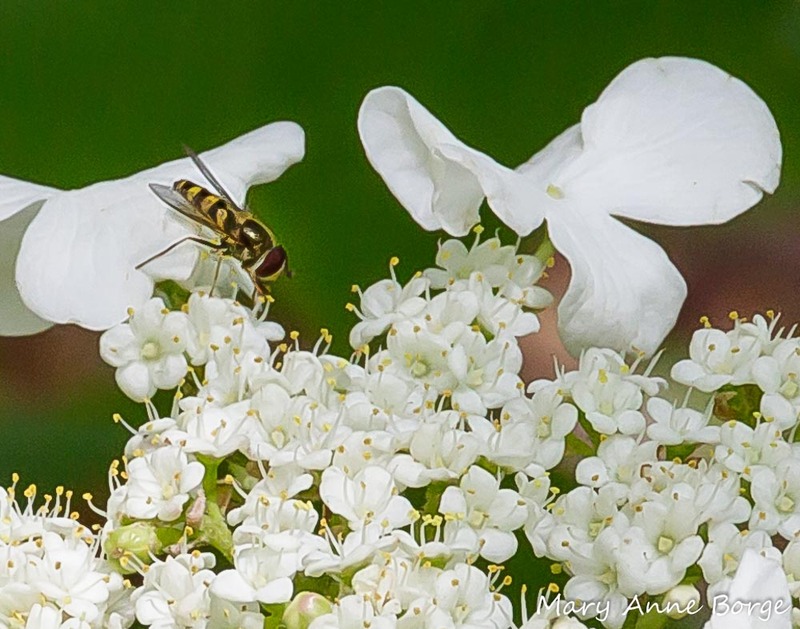 Studies show that there is a higher rate of successful pollination in Hobblebush’s fertile flowers when these showy sterile flowers are present. The sterile flowers help to advertise the plant’s offerings, luring pollinators to the inflorescence. The many small fertile flowers make efficient use of the remaining space, offering more chances for the plant to reproduce than would be the case if all of the flowers were as large as those in the outer circle. Aster family members have evolved a similar strategy. Many have flower heads with a perimeter of showy but sterile ray flowers surrounding a dense cluster of tiny, tubular, fertile disk flowers. Hobblebush Viburnum (Viburnum lantanoides) in bloom, with flies foraging on the flowers. 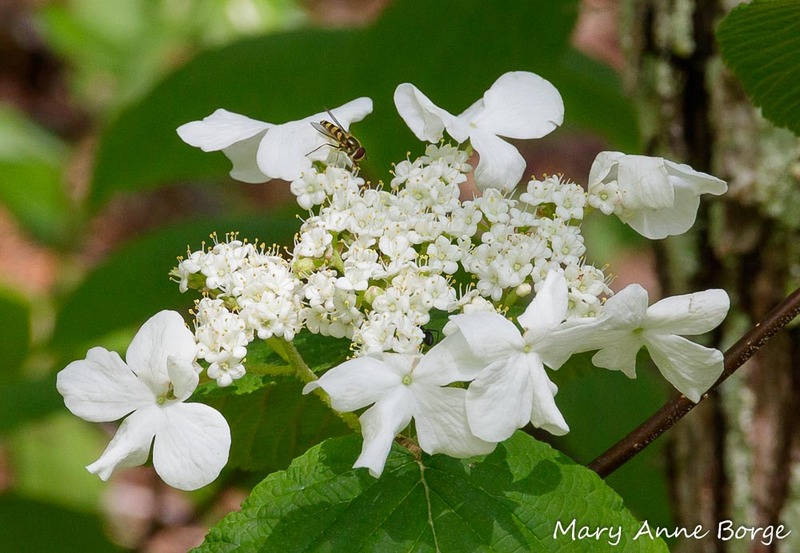 A relatively flat flower cluster like those of Hobblebush Viburnum can accommodate lots of different pollinators, including many bee and fly species. As an insect moves from flower to flower foraging for food, its body brushes against and picks up pollen from the anthers at the tips of the stamens beneath it. This is an especially effective method of transporting pollen with insects that have hairy bodies to which the pollen can easily adhere. On the day I observed Hobblebush flowers, flies were the most common visitors. Flies are important pollinators, especially when the weather is cool; many species are able to fly at lower temperatures than bees. If you look closely, you can see that the flies are actually eating the pollen. Many bees and flies harvest both nectar and pollen when they visit flowers. In addition to eating pollen themselves, female bees gather it to feed their larvae. Hobblebush Viburnum (Viburnum lantanoides) with Syrphid fly eating pollen. The coloration of this fly mimics a wasp or bee, a disguise to deter predators, but its short antennae identify it as a fly to a discerning eye. Some butterflies and moths use Hobblebush for food in a different way. The caterpillars of Spring Azure butterflies and Hummingbird Clearwing moths both eat the leaves or buds of this shrub. 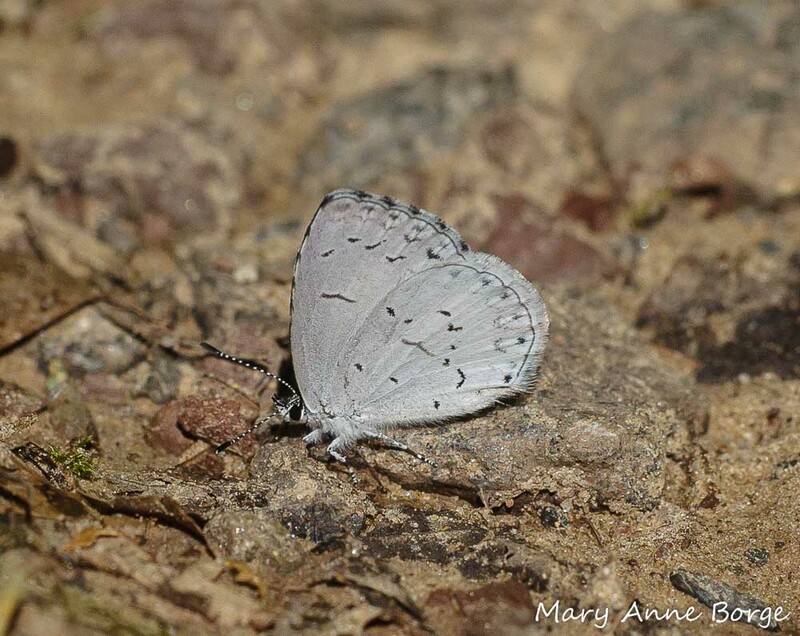 Spring Azure butterfly. Its caterpillars eat the flower buds and leaves of several shrub species, including Hobblebush. 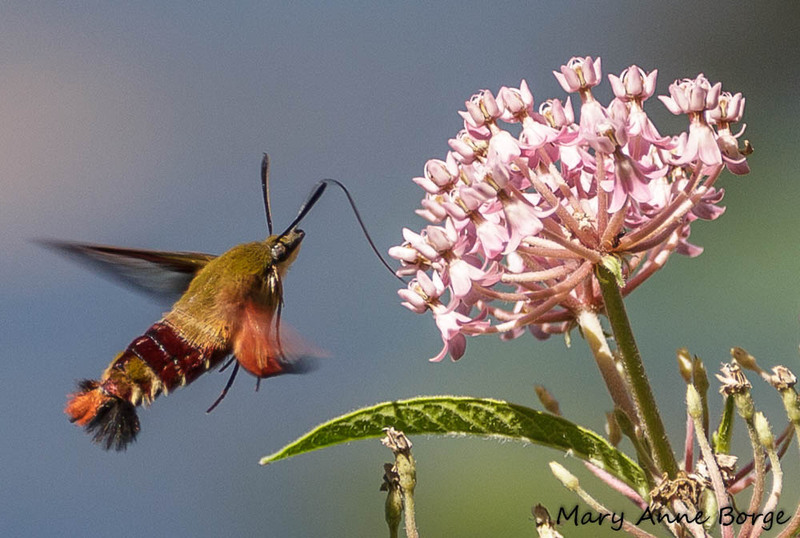 While Hummingbird Clearwing Moths drink nectar from the flowers of many different plants, their caterpillars most frequently eat Viburnum leaves. This mature moth is visiting Swamp Milkweed (Asclepias incarnata) for a quick beverage. 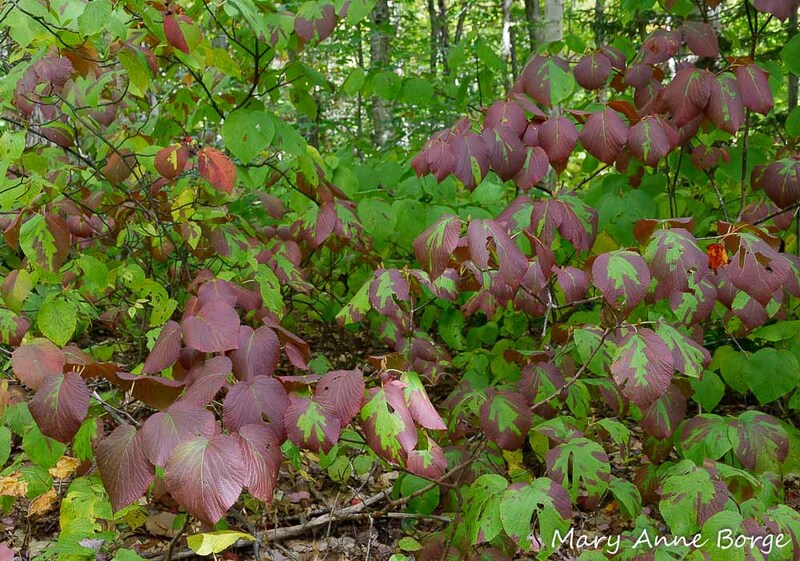 In autumn, Hobblebush leaves turn stunning shades of pink, red and maroon. Hobblebush Viburnum (Viburnum lantanoides) in fall. 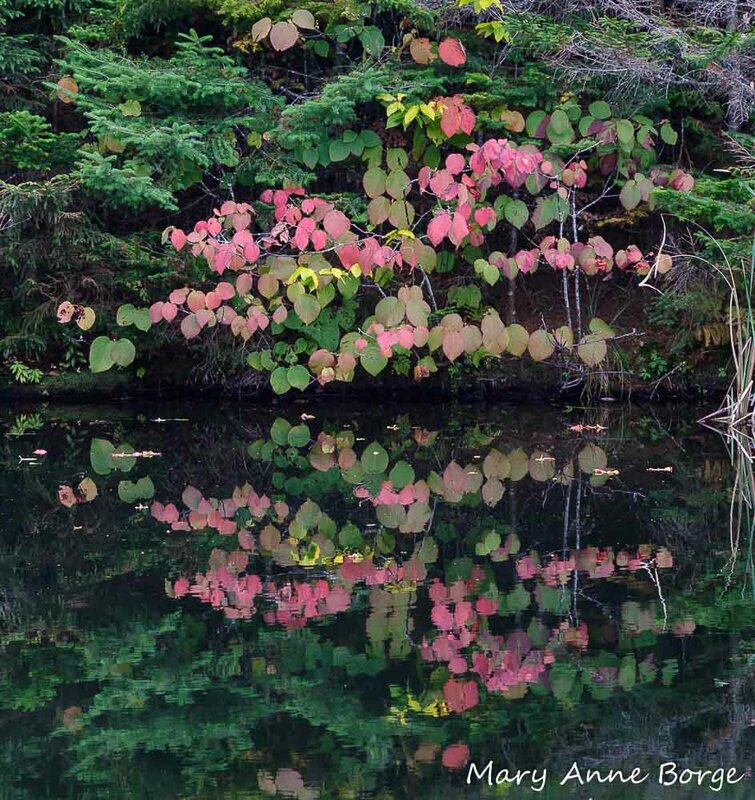 At the same time the leaves are changing color, the fruit that results from pollinated flowers ripens from green to red, then deepens to a dark blue-black. The fruit is a drupe, a fleshy fruit with its seed encased inside in a hard coating. A peach is an example of a drupe. Hobblebush fruit is edible for humans, although you may want to avoid those seeds. 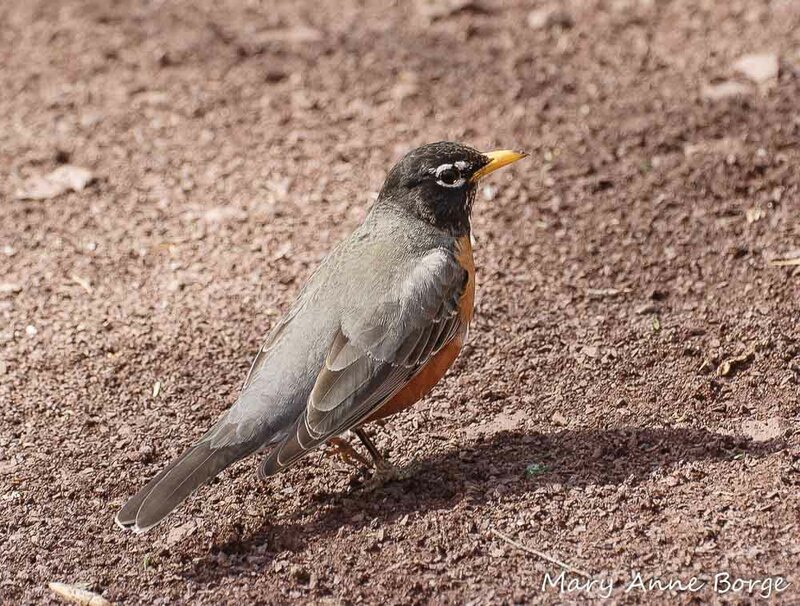 Many birds and mammals also eat the fruit, and subsequently ‘disperse’ the seeds, complete with fertilizer. 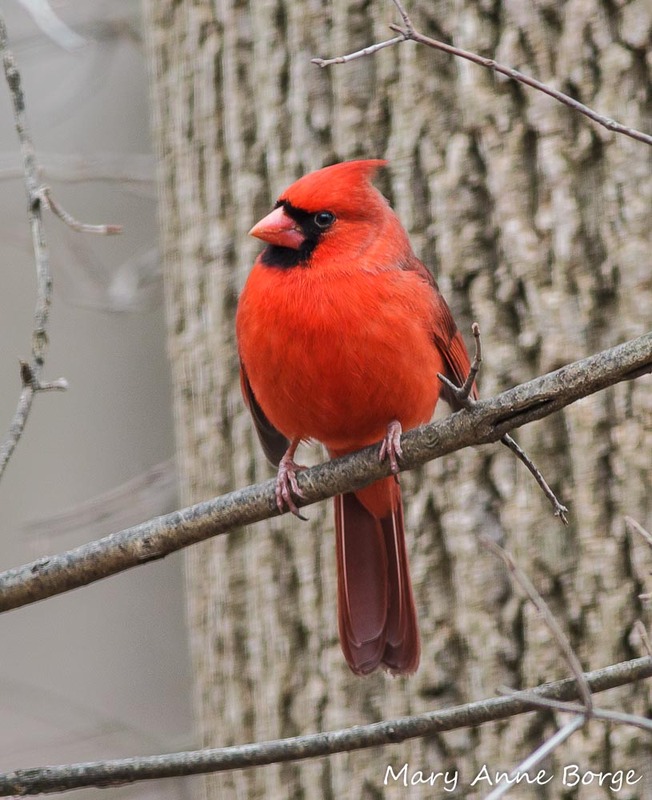 A few of the animals that eat Hobblebush fruit are pictured below. In addition to reproducing through its flowers and fruit, Hobblebush can reproduce vegetatively. 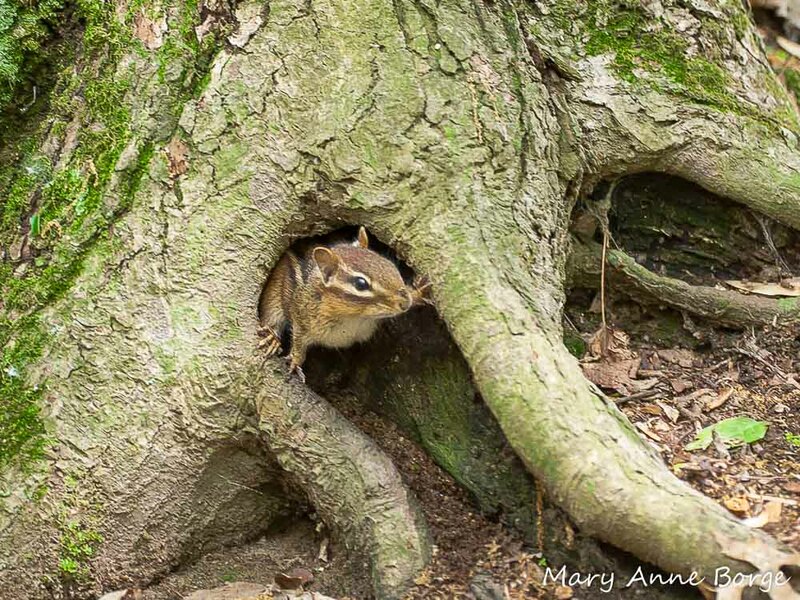 Where its branches come in contact with the ground, roots can form and a new shoot can sprout. Hobblebush Viburnum is a deciduous shrub that can be found in moist woods in Ontario, Quebec, Newfoundland and New Brunswick in Canada, and in the northeastern United States from Maine to northeastern Ohio, south to northern New Jersey and Pennsylvania, and in the Appalachian Mountain region as far south as northeastern Georgia. Hobblebush is fervent in its belief that spring will eventually arrive. We should be, too! 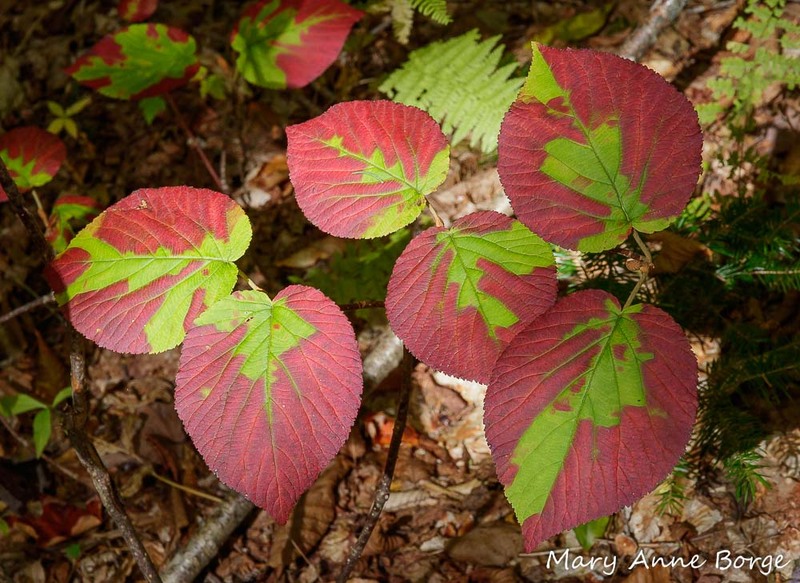 Nutritious Fall Foliage: What makes leaves so colorful? Eaton, Eric R.; Kauffman, Ken. Kaufman Field Guide to Insects of North America. 2007. 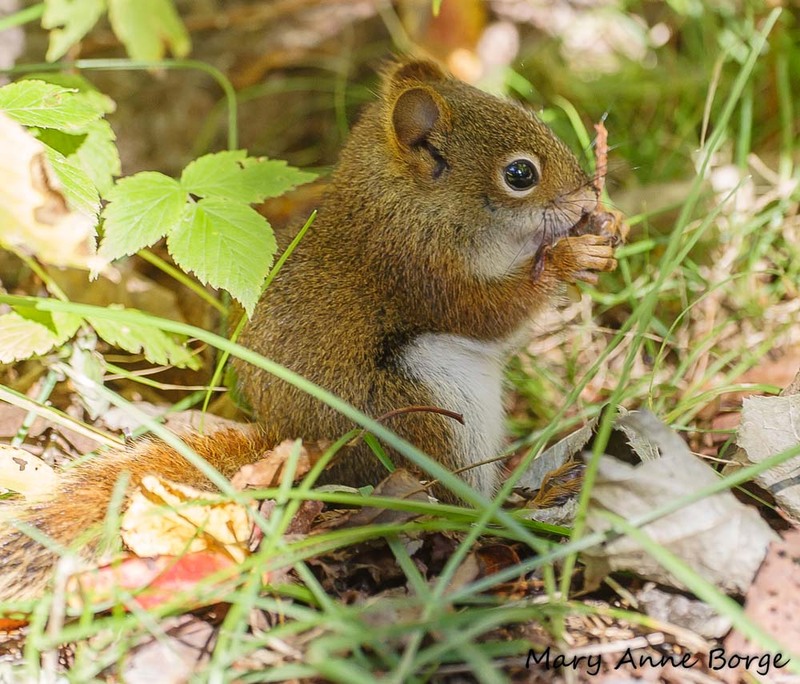 Martin, Alexander C.; Zim, Herbert S.; Nelson, Arnold L. American Wildlife & Plants A Guide to Wildlife Food Habits. 1951. Peterson, Lee Allen. A Field Guide to Edible Wild Plants of Eastern and Central North America. 1977. Thompson, Elizabeth H.; Sorenson, Eric R. Wetland, Woodland, Wildland A Guide to the Natural Communities of Vermont. 2005. Wagner, David L.; Caterpillars of Eastern North America, 2005. Annals of Botany. Sterile marginal flowers increase visitation and fruit set in the hobblebush (Viburnum lantanoides, Adoxaceae) at multiple spatial scales. Oaks Have a Lot of Gall! Virginia Creeper is for the Birds!